I took these photos a while ago. I was making use of my insomnia. At 4 am one morning I walked down to the beach and took these sunrise photos. The colours have not been altered. I may have experimented a little with the aperture and shutter-speed, but as the sun rose above the colours and then was hidden again from view, the colours changed. A man stood on the beach singing worship songs and welcomed the new day. Joggers worshiped their own bodies as they ran past, oblivious to the beauty that was emerging beyond. A plane takes off, with the start of the new day, new adventures await those on board the plane. The rowing crew pauses for a breather and watch as God paints the sky. I included a few photos from the other side of the bay, which I took at Sunset a few nights later. I have presented these photos as a slideshow. Enjoy and feel free to share it. On a quiet Summer Sunday afternoon, a friend and myself decided to explore some of the byways and backstreets of Sydney and take some photos. The slideshow underneath is a result of our time together. Enjoy the architecture, the alleyways, the park and the skaters as you take the journey with us. 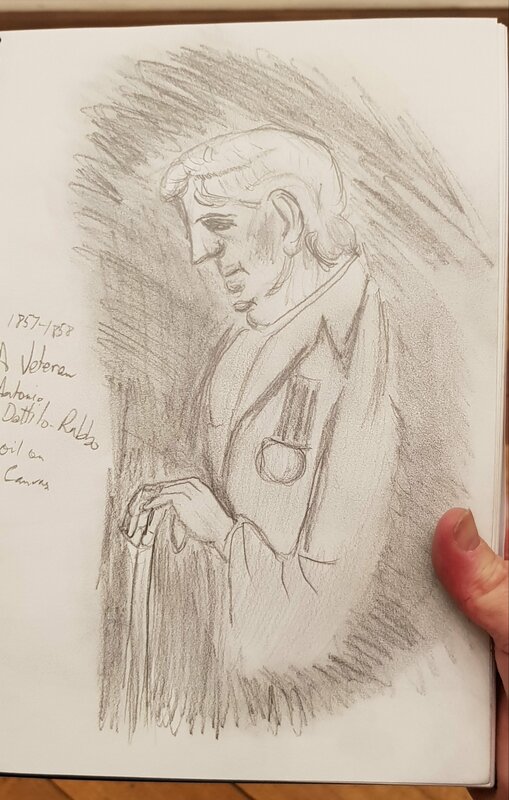 After not picking up a pencil in 12 months I thought I would go to the art gallery, armed only with a 2b pencil and my sketchbook to see what i could do with tones etc. Note that i did not take a sharpener or eraser with me. These two pictures are the result. But if she said, then what he said is moot. Kill the Artist, Burn the Art. two little boys played with their two little toys and looked on. And not listen to music ever again. He never existed, never was. What happens to her if we scrub him from existence. Innocent, live in the gaol of your already condemned life. The other evening, I was asked to photograph the New Members Ceremony for the Golden Key Honours Society from Western Sydney University Campus. Areas of Western Sydney are areas of welfare and poverty, and it was inspirational to hear stories of people who have managed to achieve high marks in their studies so far. Only the top 15% of students are offered a place in this society which prides itself on 3 pillars, Academia, Leadership and Service. I have been a member of Golden Key now for about 8 months, having first been invited when I was doing my degree at ACU. It was because of my involvement with that chapter, that I was invited to take the photos at the ceremony for new members. Deng was shot a number of times and carried schrapnel around in his body. As a result of one of his injuries, he was unsure whether he would be able to father a child. On Friday evening, he told us a miracle had occurred and he became a father 3 weeks previous. Deng arrived with his brothers, still a wounded child. When he arrived, he could not speak much English, and he could not read or write. He taught himself and did anything he could to drag himself through school and later University, graduating in Accountancy and then Masters of Law. He is now a partner in his own law firm, and a greatly sought after public speaker. Deng gave the Australian of the Year speech in 2016 and became NSW Australian of the year in 2017. It was an honour to hear him speak, inspiring the high acheiving students in the room to keep going. I hope you find inspiration in the life of Deng Adut. If a wounded Child Soldier, who cant speak English, work to achieve a Masters of Law, become a father, and help so many others, what can someone who grew up in a privileged western society do. In Australia, on the border of NSW and Victoria, there is a twin set of towns called Albury and Wodonga. What separates the two is the mighty Murray River. One of my friends recently retired and moved down to Albury from Sydney. I went to visit him in July, between semesters at Uni. Its an Historic town, with some lovely old buildings including an iconic pub. Some of the photos were taken at the lookout, up a nearby hill. Some were taken in the towns botanical gardens. Here are some of the results of that visit.